Thank You Messages for Dad: Father’s Day and birthdays will come and go, but family is forever. So pick a random day to say Thank You to the man who loves you like nobody else can. 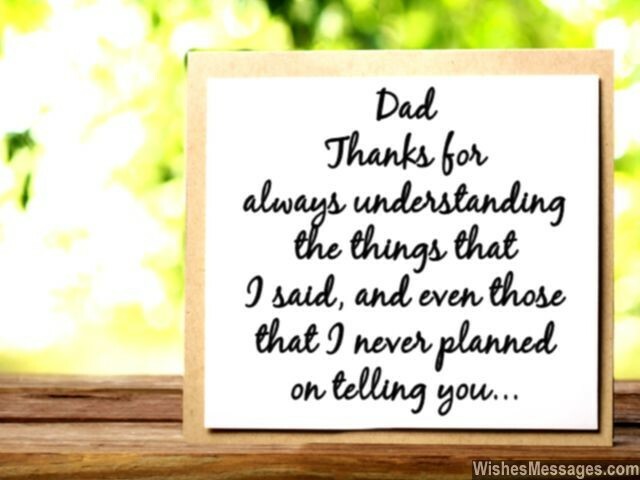 Cute quote on a greeting card, funny texts, sweet messages on Facebook or a few shares on Pinterest that reek gratitude and respect – it doesn’t take a lot to make your father feel like a million dollars. 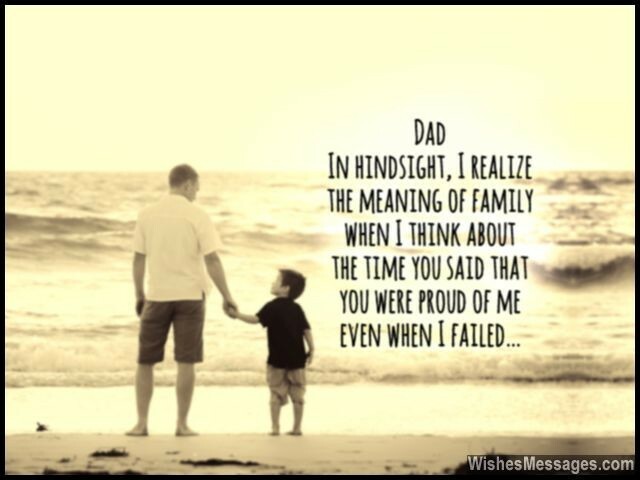 Give your old man a hug and let him know that you feel lucky to be his son or daughter. Why do this? 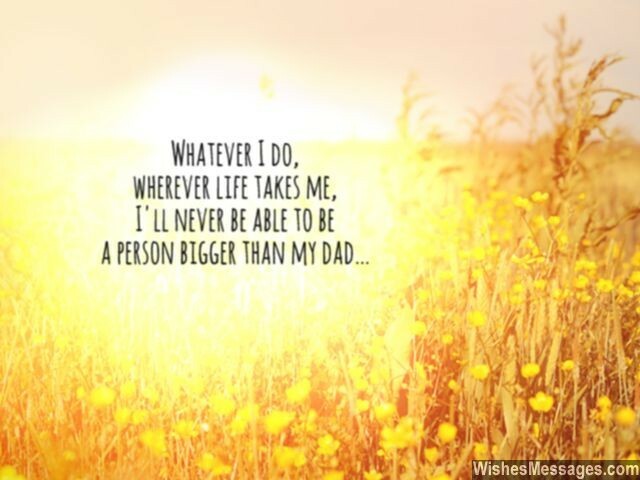 Simply because your dad works hard to give you a life that you deserve. He makes sacrifices to make sure that you have a smile on your face. His life is dedicated not to his own happiness, but yours. It’s time you give back. 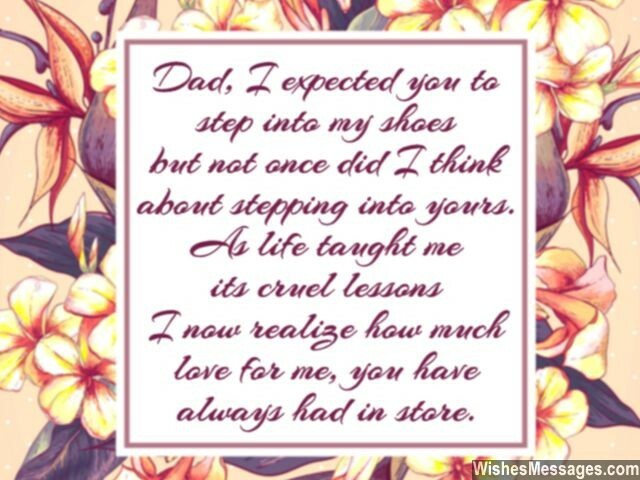 16) Dad, I expected you to step into my shoes but not once did I think about stepping into yours. As life taught me its cruel lessons, I now realize how much love for me you have always had in store. Thanks. 17) No matter how much I grow up, I will always be three things. The apple of my father’s eye, the reigning queen of my dad’s heart and daddy’s little girl. 18) You didn’t just give me birth, you gave me a good life. You didn’t just provide me education, you gave me good life experience. It is men like you, who become loving dad and glorious fathers. 19) I want to thank you for not granting me every single wish when I was small, otherwise I would have never toughened up to become the strong person that I am today. Thanks dad. 20) When I was a child, I looked forward to every day because I knew it would always start with a morning hug and end with a good night tuck from you… no matter how naughty I had been. Thanks for everything dad. 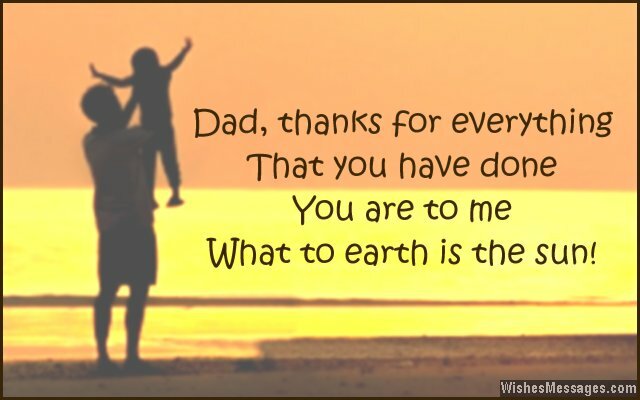 31) Dad, thanks for everything that you have done – you are to me what to earth is the sun. 32) It is because of you that I have never known what it means to have a shortage of anything in life. Thanks dad. 33) From being a girl to a woman, a lot about me has changed as I’ve grown older. Except that even today, I wrap my hand around my dad’s finger when I see him. 34) For tolerating our tantrums, for lovingly giving in to our crazy demands, for working tirelessly for our future and for being the best dad there could ever be, I just want to say – thank you and hats off to you old man. 35) When you taught me how to jump high and shoot hoops, you actually taught me how to aim high for my dreams and achieve them. Thanks dad. 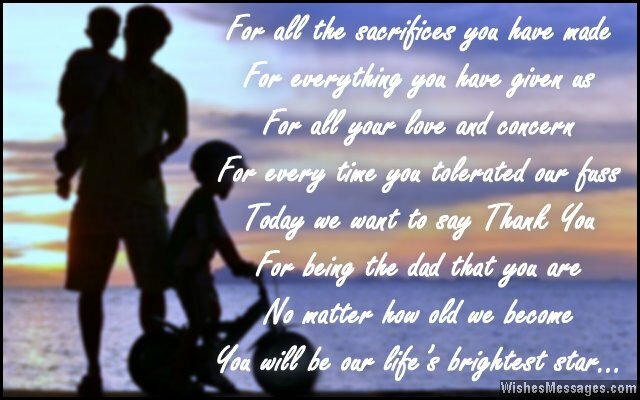 36) For all the sacrifices you have made, for everything you have given us. For all your love and concern and for every time you tolerated our fuss – Today we want to say thank you, for being the dad that you are. No matter how old we become, you will be our life’s brightest star. Thank you. 37) Just so you know, my phone’s wallpaper is a picture of you holding me when I was little – because the bottom of my heart is a permanent soft spot for you. Thanks for getting me the new iPhone dad. 38) You may have been a perfect husband, brilliant son, awesome uncle, reliable brother, amazing nephew and trustworthy cousin. But the way you have been an extraordinary dad beats them all. 39) For me, FATHER is the abbreviation for Forgiving Affectionate Tolerant Humble Energetic and Respected. Thanks for being the awesome dad that you are. 40) Your jokes annoy me, your punishments make me frown. Your enthusiasm at family events irritates me, your advice makes me feel bored. But all this superficial stuff aside, I want to confess that my feelings for you are nothing but love and respect. I may be a naughty teenage girl, but deep down inside I will always be daddy’s little girl. 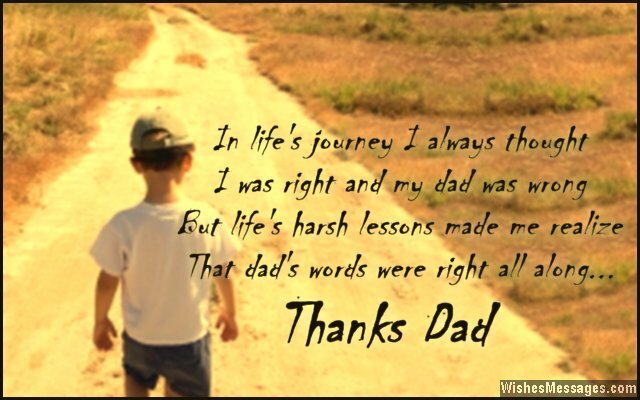 Thanks for everything dad.